As the end of the year quickly approaches the holiday season is upon us. From Thanksgiving feasts and early morning Black Friday trips to Christmas tree shopping and New Year’s Eve celebrations, there is a lot going on this time of year. These holidays are extremely family oriented and is the time of year when many will be braving traffic and less than ideal weather conditions to see family and friends. Holiday traditions are coveted and many will not let distance or a winter storm stand in the way. Unfortunately, the holiday season is exactly when the likelihood of accidents resulting in injuries see an increase. It is important to make yourself aware of these potential dangers so you can avoid them and remain safe this holiday season. 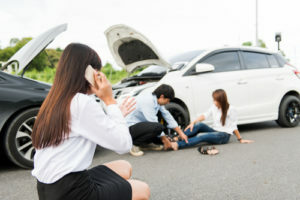 Whether a car, truck or motorcycle, motor vehicle accidents are likely during the holiday season. For starters, many people end up traveling to visit family and friends, making roadways crowded and congested. The sheer number of vehicles on the road make it increasingly likely that a motor vehicle accident will occur. On top of that, the fall and winter months bring rain, sleet and snow, all of which create hazardous road conditions for any type of motorist. With heavy rain, there runs a risk of flooding, which can be damaging to vehicles. In addition, visibility is low and roads are slippery, making emergency stopping difficult, as well as turning. With cold temperatures, snow and ice become a dangerous factor. They decrease traction, which can cause you to lose control of your vehicle while driving. Black ice is especially concerning as it is a thin sheet of clear ice that looks exactly like a clear roadway. If road conditions are hazardous, it might be advisable to stay home and keep your family safe. A car accident could result in serious injuries like traumatic brain injury or back and neck injuries. Aside from driving, those taking to the street can also face hazardous conditions. Pedestrians can end up injured when crossing the road, especially when out trying to get some holiday food and gift shopping done. A pedestrian accident can be especially harmful since you do not have any form of protection. When crossing the street it is important to utilize crosswalks and try to cross at traffic lights. Be sure to look both ways before crossing and to continue looking both ways as you make your way across the street. Slip and fall accidents are also common during the holiday season. People entering stores or other buildings after being outside in the snow or rain can create a slippery surface on floors and stairs. A simple misstep could lead to a fall and an injury. By law, a property owner is required to maintain safe conditions for any that might be frequenting their property. That means cleaning up snow from sidewalks and walkways and mopping up wet floors and stairs. Proper signage warning of potential hazards could also be utilized. If you slip and fall and sustain an injury where the aforementioned precautions were not taken, you could have a premises liability claim on your hands. As long as you were not liable in the incident (ignoring signs of danger or distracted by your phone), you could be compensated for your injuries. Whether you were injured in a car accident, a slip and fall incident or other type of injury, you will need the help of Purchase, George & Murphey, P.C. The Pennsylvania personal injury lawyers have years of experience helping clients throughout the state. They will work towards getting you maximum compensation for you injuries. That way you can concentrate on recovery. Fill out the online contact form to see what they can do for you.